Photo taken in 1978. Photo taken June 14, 2015. Physical appearance: This spacious one–story Craftsman house, with its hovering, shallow–pitched roof, is notably simple and coherent in form, with an inviting wrap–around verandah at the front and well–kept surrounding grounds. 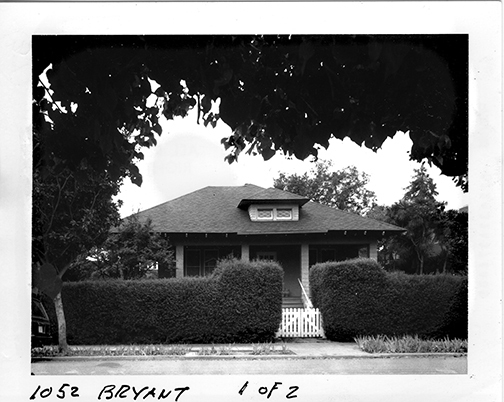 Significance: The house was built for J. W. Osborne (uncle of John O. Varian, 1044 Bryant Street), an inventor who originated a process for photo–lithography. 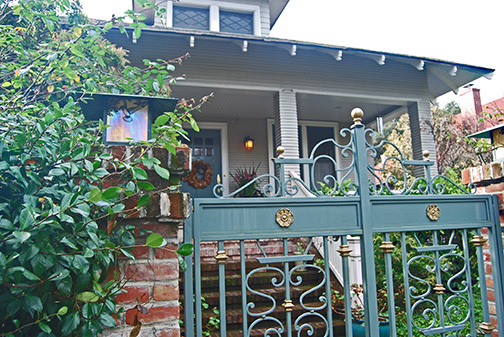 He died the year after the house was completed; his widow, Mrs. Charlotte * Osborne (1826–1916), lived there for several years before she moved to San Jose, where she was known for her large collection of Lincoln memorabilia. 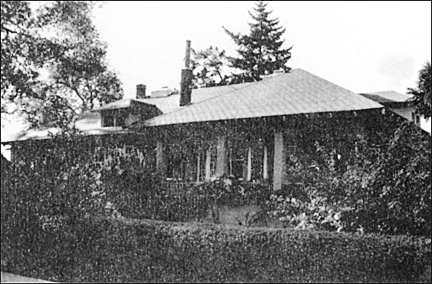 Sometime after 1910 to 1924, it was the home of Mr. and Mrs. H.W. Simkins. 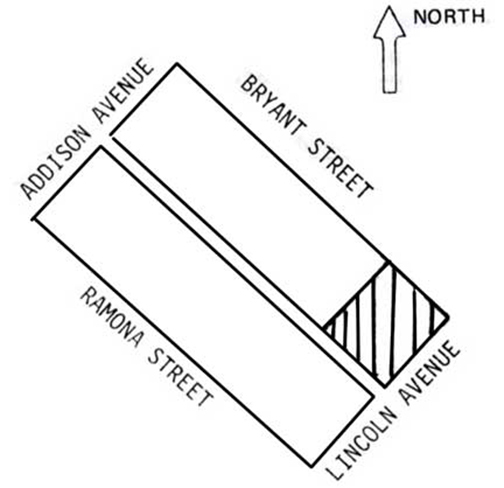 * Having come to Palo Alto in 1892, Simkins established a book and stationary store and, from 1902 to 1919, was editor and proprietor of the Palo Alto Times. He also served as City Clerk (1894–1909) and helped write the City Charter of 1909. Mrs. Simkins was a very early (1896) member of the First Methodist Church of Palo Alto. The Simkinses moved to San Francisco in 1924, shortly before his death; Mrs. Simkins (1868–1947) returned to the community in the 1940's. The successors to the Simkinses were Frank M. Hall and his wife Gladys. Mr. Hall was in the insurance business. 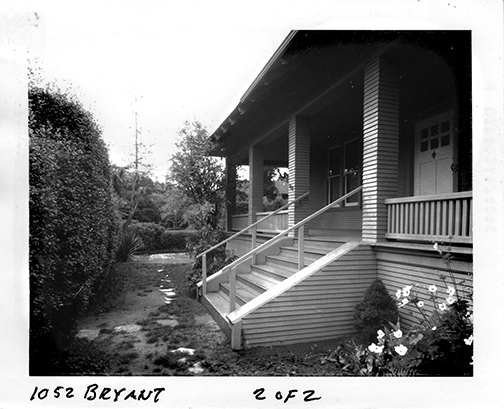 Although periodically renting the house to others, the Hall family has owned and usually occupied it from the mid–1920's to the present (Frances M. Hall, 1981). 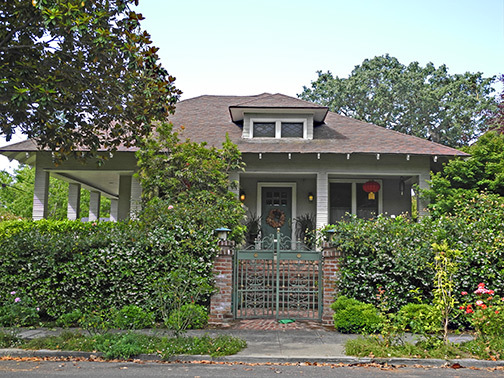 This house was built in 1900 and is a Category 4 on the Historic Buildings Inventory. The architect was Frank Delos Wolfe and the builder was Frank W. Wise. The property measures 90 by 150 feet. Sources: Palo Alto City Directories; Palo Alto Times 5/22/00, 8/1/16, 1/15/25, 3/30/36, 1/20/47; Guy C. Miller, Palo Alto Community Book, (P.A. 1952), p. 309. Notes to corrections made May 20, 2018: * The 1900 Census lists Charlotte as the wife of J. W. Osborne and not Julie as originally stated. **"From 1908" changed to"Sometime after 1910"